This course helps tackle the common and often challenging ethical issues that affect patient care. 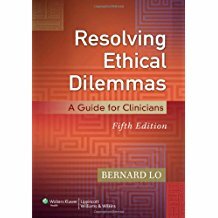 It explores a wide range of real-world ethical dilemmas, each accompanied by expert guidance on salient issues and how to approach them. This text, written by a physician, has 351 pages. We have reproduced 93 of these pages for this course. The course does not include the book itself.